This is an old fashioned delicious cake. So much so, that I haven't been able to stop eating it since I made it. It's fairly simple to make - by which I mean, foolproof, I'm not much of a baker - though it takes a couple of steps. The results are not little cakey, they are mushy and difficult to keep together, but oh, are they delicious! I'd definitely make this again. I did make one substitution to the recipe. Instead of the margarine it called for, I used butter. It didn't specify what type of brown sugar to use, so I used dark. Preheat the oven to 350F. Grease a 13"x9"x2" pan. Pour the boiling water on the oatmeal, mix and set aside. Cream the butter. Add the sugars and the eggs and mix well. Sift the flour, salt, baking soda and cinnamon a little at the time into the butter mixture. Mix well. Add the oatmeal and mix. Pour into the pan and bake for 45 minutes to 1 hour. Mix the butter, sugar and milk in a medium pan and bring to a boil. Boil for one minute and remove from the heat. Add the pecans, coconut and vanilla and mix well. 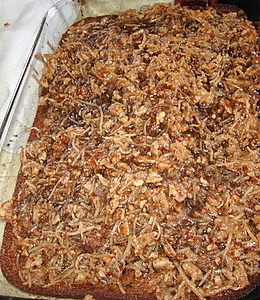 Spread the topping on the cake, and return to the oven until the coconut starts getting light brown. Cool and serve.